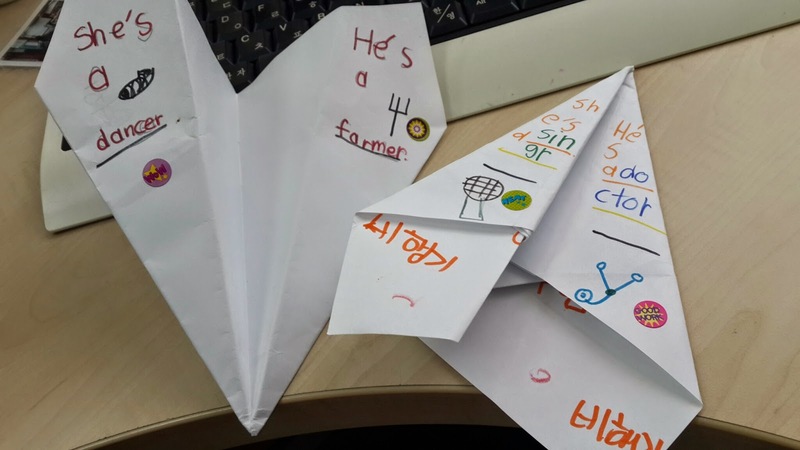 Today I had all my classes play a simple paper airplane game that helped them with their lesson vocabulary. I've used this airplane game before and played it like the hammer game. 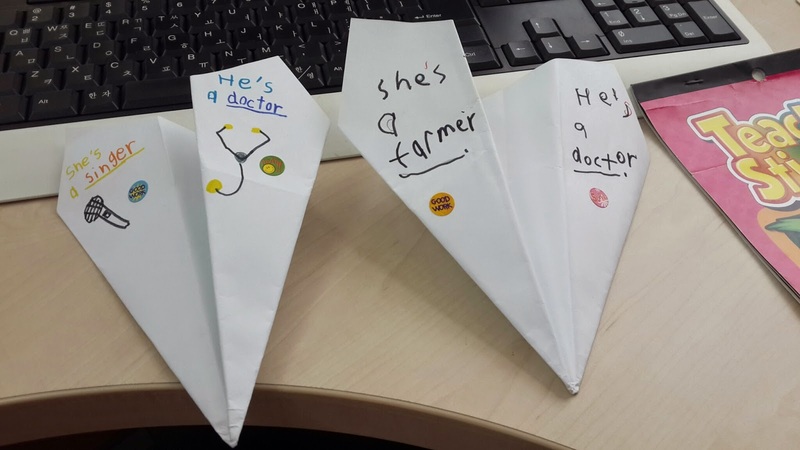 But this time I tried to introduce more speaking via role-play which takes place within the throwing of paper planes. You can use this as a warm up or end of lesson game. 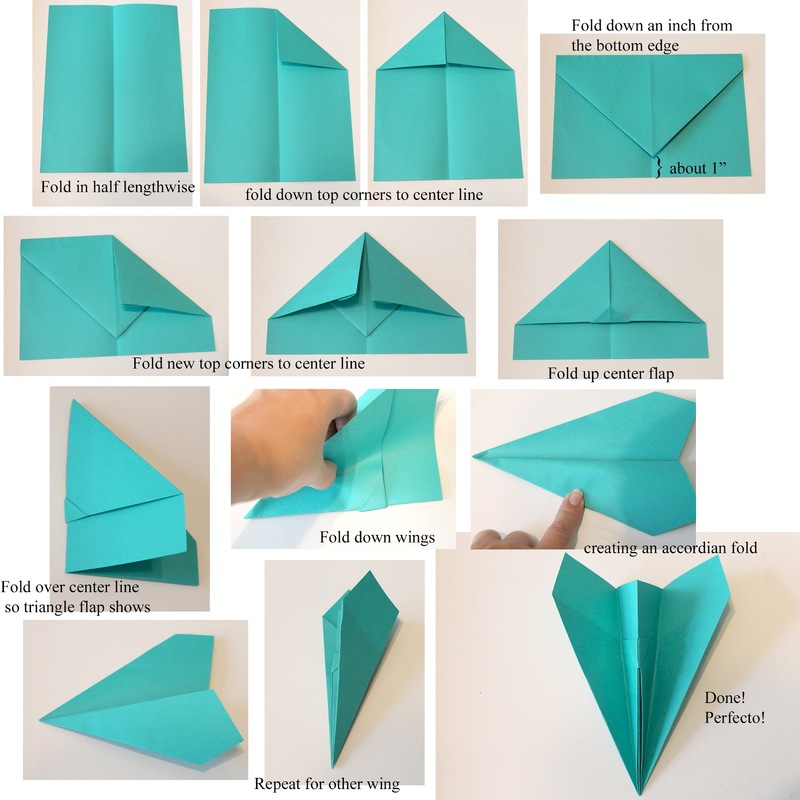 First, I showed them a picture I found online for how to fold an airplane, the one below is what I used... It's good to have an illustrated guide and also fold along with them and show Ss who are having any troubles how to do it with your own demo one. 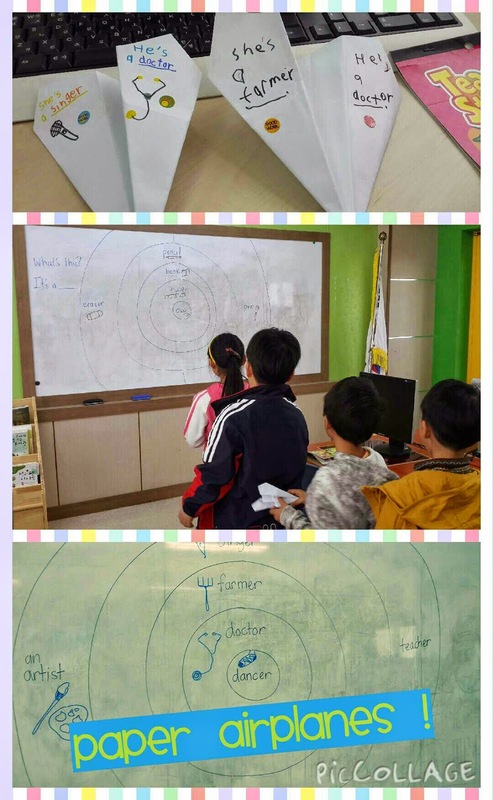 Grade 3- Topic "What's this?" Students make a line and I ask "What's this?" then they fly their airplane and try to hit any word/target area on the board. Depending on where they land they answer "It's a _________." Everyone takes a few shots each, rotating in their line one at a time. Extra time? Ask one of the students to be the teacher and ask "What's this?" Or you can play by reversing the dialogue. The student asks you "what's this?" and you reply with "It's a ________" and they have to try aim for what you said. 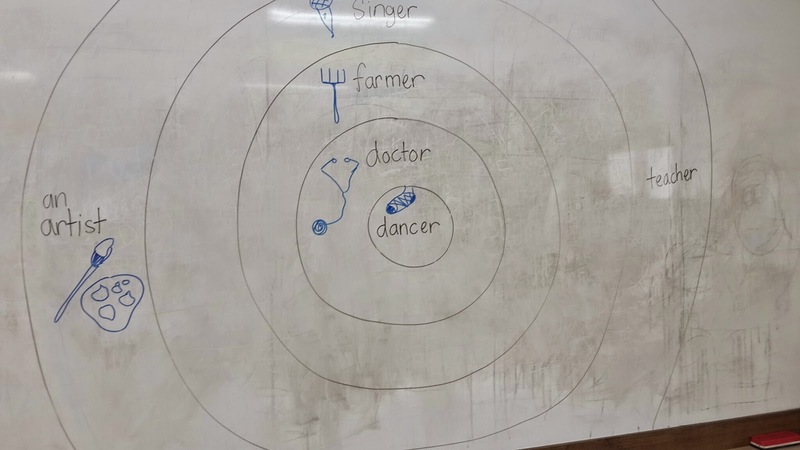 Vocab: "singer, farmer, doctor, dancer, artist, teacher"
"He's/ She's a ______________. " "an" " He's my brother" "She's my sister" "Who is she/he?" They reply with either He's my brother or She's my sister. Then they have to fly their airplane to wherever on the board , where it lands determines what job their sister or brother does. So if the plane hits dancer they say "He's a dancer" / "She's a dancer." B: She's my sister / He's my brother. B: She's a ________. / He's a _________." Have a bag full of cards that have either 'she' or 'he' written on them. Before they shoot their plane, they pick a card without looking from the bag. If they get she then they have to use 'she' in their dialogue ("She's my sister. She's a doctor.") and vice versa for 'he' cards. Grade 5 - Topic - Whose ball is this? Dialogue: "Whose _________ is this?" / "It's ________'s ______." I played this in teams because it was one on one - you could also play in teams for large classes (boys vs. girls, etc). A point is awarded to every successful hit. I said "Whose __________ is this?" then the student would have to hit the object I said. E.g. I said "Whose camera is this?" 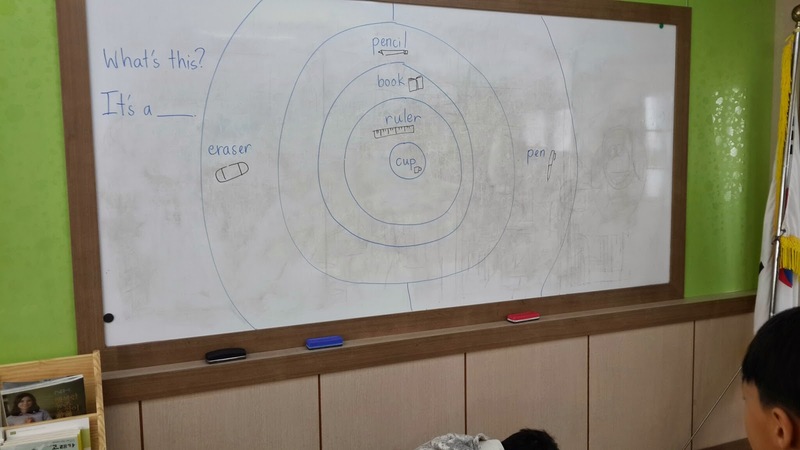 so my student aimed for "Baia teacher's camera" on the target. Before flying his plane he had to say "Baia teacher's camera" also. I played against him so he and I would take turns saying "Whose _________ is this?" therefore controlling the target and practicing the vocab. Dialogue " You're good at _____________" "singing, cooking, playing soccer, drawing, helping people, English"
"You should be a/an ___________"
I say "You're good at ___________" and the students must match my sentence to the correct job. 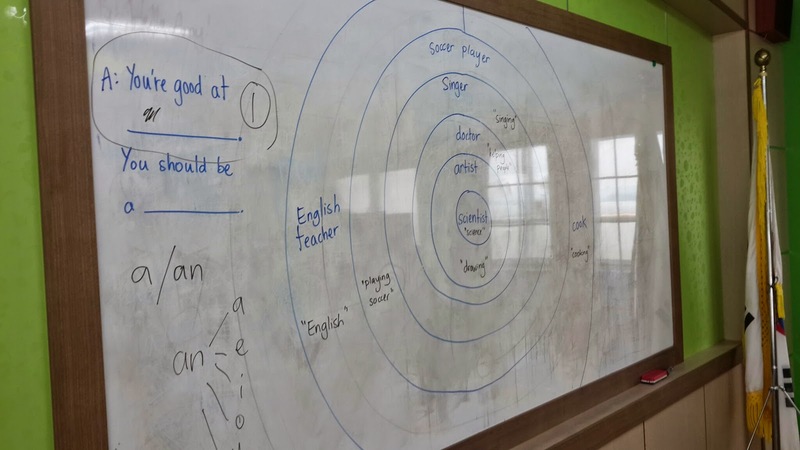 For example, in the English teacher zone I wrote "English" which means that they can make the sentence "you're good at English" and this corresponds with "You should be an English teacher." 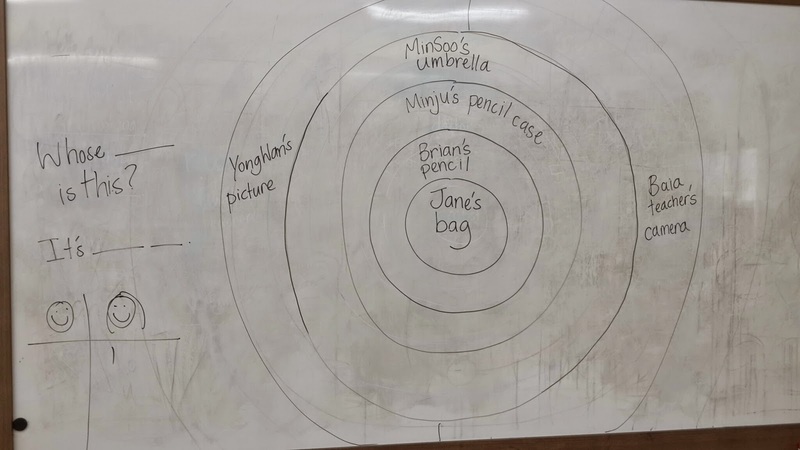 After the students say the correct "you should be a ________" sentence they then have to try hit the right target / job zone. I say "you're good at drawing." 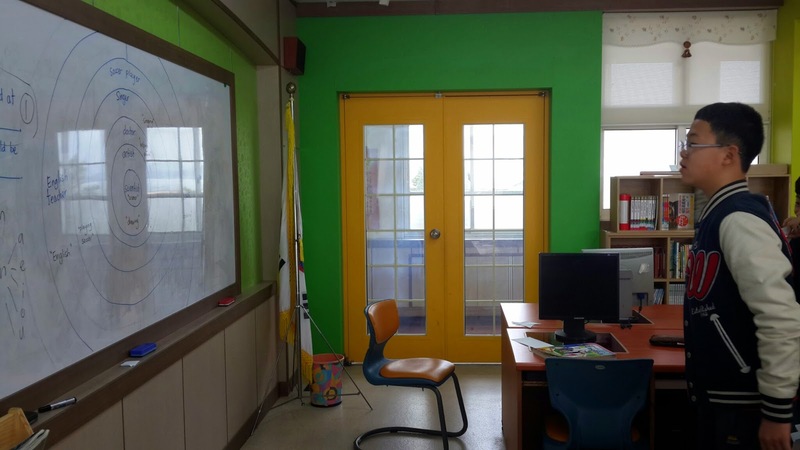 The student replies with "you should be an artist." and takes her/his shot. I say " you're good at playing soccer." 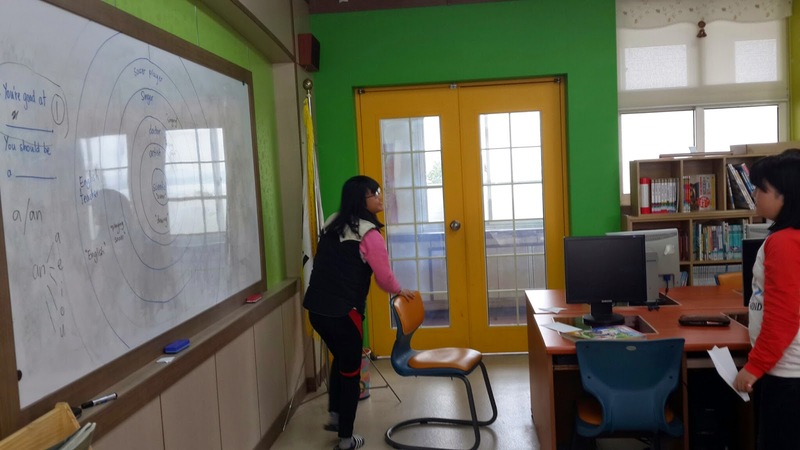 Student replies "you should be a soccer player"
Have the students take your place by saying the "you're good at_________" sentence to their classmates who are flying the airplane. So as you can see, it's easy to design your target board and you don't need to be a master of circle drawing either. After the game I suggest you have them write out the practiced vocab and/or sentences on their paper airplanes , if you have time. This is a quick writing practice that's spiced up by simply writing it on their airplane than in their textbook. After playing this airplane game the dialogue was in their heads and practiced well. I would highly recommend this for the start of any topic as it's so easily adjustable! And for any level of ESL. Have you always dream of taking to the skies like a real pilot? What if I told you that you can experience the closest thing to actually flying a REAL plane in the comfort of your home.... with state-of-the-art realistic flight modelling system and actual controls of the cockpit! Download the games now and enjoy. Around The World Summer Camp! Free Worksheets and Powerpoints! Fun Comparative Adjectives Lesson - A Creative PPT that Keeps them learning and laughing! Simple Powerpoint Memory Game For Reviewing Weather - or Anything! can you come to my party? can you make a byurger? Do you want some more lesson? ESL how old are you? esl what does she look like? hello can I speak to Jinu? how do you say it in Korean? May I drink some water? May I go to the bathroom? May I make a wish? May I take a picture? what does he look like? what will you do this summer? whose pencil case is it? why are you so ? will you come to my party? Just about all my resources are available through Teachers Pay Teachers! Visit my store there now for lots of free downloads. A great site full of resources for ESL teachers and more!